Are your employees afraid to embarrass themselves? Those of you who have been following this blog for a while know that I have a fascination with Epic Fantasy novels and I find many management lessons in them. Yesterday, it happened again. I am currently reading Terry Goodkind’s Soul of the Fire and came across between two characters. I need to set the stage. These are newlyweds (Richard and Kahlan) that are deeply in love. They also had a number of extraordinary experiences and learned to trust one another deeply. Now, check out this exchange between them. Richard was relieved not to have embarrassed himself. If for a moment you ignore the fact that the conversation deals with magic, you will notice that this is a conversation that happens in every office around the world every day. Usually, the conversation is in our heads. The most important part of this exchange is actually the last line: “Richard was relieved not to have embarrassed himself”. Here is a man, a leader of men, talking to the love of his life, who he shared life and death experiences with and learned to trust. And still, he is afraid to speak up his mind. He is afraid to be embarrassed. I ask you this: how many times in your life did you want to speak up and haven’t because you felt afraid to be embarrassed. How many times does it happen to your peers or employees every day? More importantly, what are we missing because of this? In the story, this conversation led to an important discovery. And if you substitute “Magic” with “Science”, “Marketing”, “Finance” or any other word, you can see the resemblance to the quote. To some people, these professions also seem like magic. There is a term in the research of teams called psychological safety developed greatly by Harvard researcher Amy C. Edmondson. It deals with how safe do team members feel in voicing their opinions, talking against the accepted norms and how generally confident are they that when they will speak up, they wouldn’t be ridiculed and their thoughts will be accepted positively even if they are wrong. There is a lot of talk about diversity in the workforce and its importance. But in order to enjoy the benefits of diverse opinions, viewpoints and thoughts, managers must take action and make sure their people feel safe to speak up. We all like to make fun of the folks who we think are a bit deluded. But, given that much of success in life is gained through dogged determination and no taking “no” for an answer, being deluded is highly underrated. When it comes to work, career, love, a touch of delusion is probably a very useful device. Great ideas and inventions come from the Iconoclasters, people who go against the established dogma or conventions. Deluded people. But if we want to enjoy their wisdom, we need to let them speak, and more importantly, feel safe to speak. 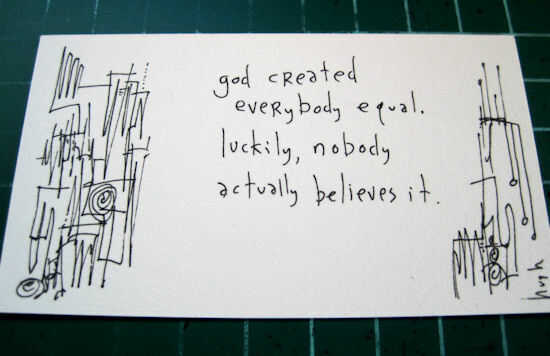 One of my favorite bloggers, Hugh MacLeod, from Gapingvoid, has started a series of posts where he designs business cards for people he admires. He designs a card for them and puts it on his blog explaining a little bit about that person and why the card represents him. 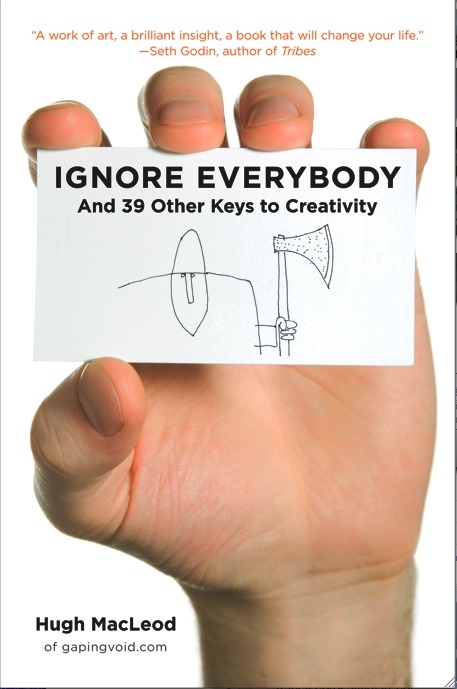 The picture above is from his latest cards for Web 2.0 Guru Chris Brogan. Equality is an important concept in many aspects of life, especially in the legal field, as I know so well. But in real life, because equality is intertwined into our thinking DNA it is used in ways that many times hinders excellence. Earlier I mentioned Ken Robinson‘s inspiring speech regarding creativity and education. In it he says that standard and equal education for everyone is not necessarily good because it “misses” people’s strengths. All men are not born equal. Whoever tells you that is lying. All man should deserve an equal opportunity to excel, to be happy and to use their comparative advantage. That is the truth. And there is a big difference between the two. Nobody can be good at everything. People who truly excel do it by recognizing their comparative advantage, maximizing it and letting other people do what they are better at than them. Members are not treated as equal because in fact that they are not equals: each individual brings special talents and interests to the ensemble and also has some areas of relative disinterest and lesser strengths. Orpheus members recognize that fact and exploit it relentlessly in the interest of collective excellence. The orchestra’s willingness to acknowledge, to respect, and to exploit the individual differences among its members is one of its greatest strengths as a self managing team. Are you sacrificing performance for artificial equality? Two seemingly unrelated posts I read this week made me think again about an issue that I think is at the heart of business strategy and leadership. Tradeoffs and priorities. The accountants, predictably, recommended that they go with the cheaper coffee option. Numbers don’t lie etc, it was better to tick off 10% of their customers than 100% etc, cheaper coffee was the “obvious” thing to do etc etc. Howard didn’t do that in the end. Instead, he raised the prices accordingly, and left a note in every store, telling people why his company was forced to regretfully raise their prices. And he also told them about the option he could’ve taken but chose not to i.e. cheapen the coffee. And you know what? The customers understood his reasoning, and stood by the business. 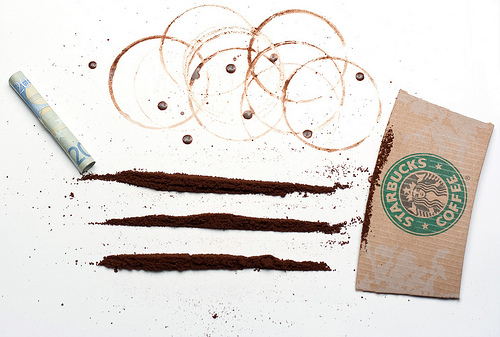 Eventually wholesale coffee prices came down again, allowing Starbuck’s to lower their prices as well. The company weathered the storm and the brand ended up all the stronger for it. Life was good again. In a nutshell, it is a culture that is “proud to be cheap” in good times and bad. Their people cut erasers in half, turn off the lights when they leave the building, bring their lunch to work, fly in the back of the bus, and stay in Day’s Inns. More important, they are always on the alert for ways do things on the job more cheaply, without compromising quality and service standards. Nothing is wasted, nothing is redundant, and nothing is overlooked when it comes to doing it on the cheap. These seem to be two very different stories. But actually, they are the same. It is the stuff success is made of. Tradeoffs. Priorities. Consistency. Average is the most dangerous path. If you do something, go all the way. Pure you heart into it. Make everything about your concept. Build the decision around it. Sure, at times it might not seem like a good idea. At times, everybody will tell you that you need to settle. That principles are good but they don’t provide a living or they don’t satisfy the shareholders they will say. I think it is all nonsense. Ignore Everybody. The problem with stories about companies’ strategies and CEO’s decisions is that sometimes they seem distant. How many of us are going to be CEO or make decisions that have so much impact? In this case? Every day. Every one of us makes many choices every day. And each of these choices could be comprise or could be a tradeoff. What will your next decision be? I’ve often been asked by young people, which do I think is a better career choice: “Creativity” or “Money”? I say both are the wrong answer. The best thing in this world is an effective human being. Sometimes that requires money, sometimes it doesn’t. Be ready for either when it happens. Sometimes, there is not much you can add. I am sure as hell trying to be an effective human being. What about you? Want a simple explanation? We believe that “like goes with like”. We think the big effects must have big causes and vice versa. According to some researchers, that is why it took so many years to understand that Malaria comes from mosquito bites. Could such a horrible disease come from such a small insect? Well, yes. However, the representativeness heuristic is much more common than you think. If something looks simple, we assume it is simple. 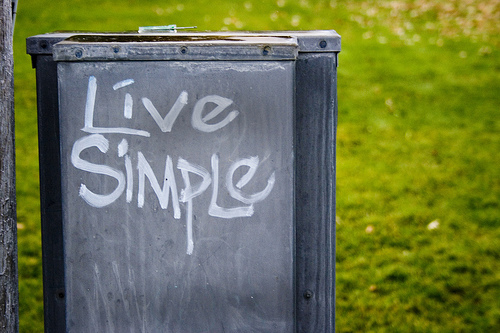 Yet, as one of my professors is fond of saying – “simple does not mean simplistic”. Being good at anything is like figure skating – the definition of being good at it is being able to make it look easy. But it is never easy. Ever. That’s what the stupidly wrong people conveniently forget. Think about it. Look around you. My favorite example. Sports. You sit on your couch at home and watch the player miss an easy shot. “Come on!” you shout out. “What a loser! Such an easy shot”. But it’s not easy. Chances are you could not make that shot. It looks easy, because you have seen professional athletes, who probably have been practicing since they were 6 years old for thousands of hours, doing it again and again, make such a shot. They make it look simple. And it is simple. Put the ball in the basket. Couldn’t be simpler than that. But it is not simplistic. Ever. This is the heart of the 10,000 hours idea so popularized by Malcolm Gladwell in his book, Outliers. And why am I writing about this? Because so many of the issues I write about in this blog seem so simple. The concepts a great manager should understand and follow are not rocket science. Yet, the fact that they are simple does not mean they are simplistic. The so called “soft skills” are the hardest to master. We should not confuse like with like. To get to the simple, we need to pass through a lot of complexity. I would not give a fig for the simplicity this side of complexity, but I would give my life for the simplicity on the other side of complexity — Oliver Wendell Holmes, Jr. When surrounded by individuals all voicing an incorrect answer, participants provided incorrect responses on a high proportion of the questions (32%). Seventy-five percent of the participants gave an incorrect answer to at least one question. The Asch Effect is a well-known phenomenon that almost everybody experiences. I am sure each and every one of you has been in some situation where he didn’t say what he really thought because of the group. I am sure many of you changed their opinions depending on what they heard from others. And still, we conduct meetings and lead teams like this is not an issue we have to deal with. The better the idea, the more “out there” it initially will seem to other people… Good ideas alter the power balance in relationships. That is why good ideas are always initially resisted. When the confederates are not unanimous in their judgment, even if only 1 confederate voices a different opinion, participants are much more likely to resist the urge to conform than when the confederates all agree. This finding illuminates the power that even a small dissenting minority can have. Interestingly, this finding holds whether or not the dissenting confederate gives the correct answer. As long as the dissenting confederate gives an answer that is different from the majority, participants are more likely to give the correct answer. As usual, the answer can be found in the process. First, we need to try to create a way where everybody submits their ideas or judgments without hearing everybody else’s answers. The default of going around the table and hearing everybody turns out to be a terrible default. Second, more importantly, always appoint a devil’s advocate. Especially, when there seems to be a consensus. Somebody who will voice concerns and raise important issues, even if they are false, just to elicit more ideas from the rest of the team and to overcome the Asch Effect. Third, use change in management. Change orders, places and roles within your meeting. Not only it will prevent from one person to always hear the rest of the people talk, it will also prevent stagnation in the norms and will elicit more creativity. Brain research has shown that just by changing the environment, even in small scales, our brain must react with more thinking. We can overcome the Asch Effect. But we must try very hard not to forget it. An artist is like every professional. He is very good at something. He has his strengths. But the problem is that he has to do so much work around that doesn’t use those strengths. It may be administrative. It may be marketing. Or it could be anything else. And every second he is not doing what he is good at is a waste of time, effort and a moment where we all miss on his art. I am sure you felt it before. I know I have. Working as a law intern is all about wasting your time and doing things that are under your potential. Work that can be easily done by someone who did not study law for 4 years. And when somebody complains about it, the answer is usually something like: “this the way it has always been, it’s part of the territory”. “Decide how to exploit the constraint (make sure the constraint’s time is not wasted doing things that it should not do)”. Employees being the constraints in the good sense of the word, of course. But the idea is still the same. I believe it is all about the process. The way your business or team operates, should support the people in it and their strengths. You need to decide which employees are your priorities, your valuable assets, your constraints, and build the business around making sure they have the ability to employ their strength if not all the time, most of the time. The process should not only be effective by itself, it should support and make sure that the right people are effective.